Sleeping with the enemy. 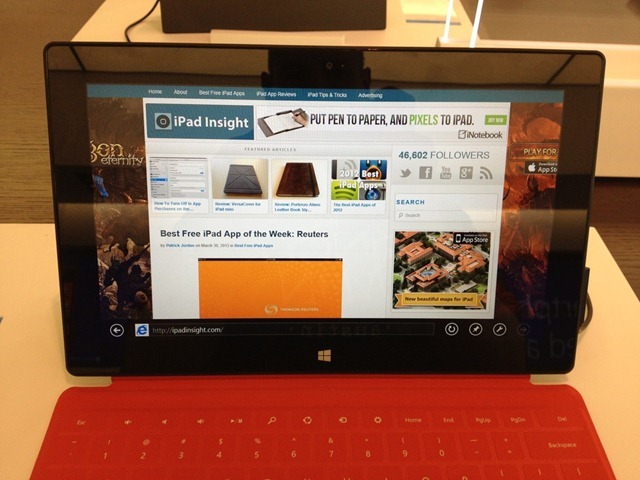 iPad Insight on Internet Explorer on a Surface RT tablet in a Microsoft store. Yesterday I visited a Microsoft for the first time, and spent a lot of time playing around with the Surface Pro and Surface RT tablets. Once I’d had my fill of trying them out I couldn’t resist firing up iPad Insight in the IE browser. I would have done this sooner, but I never knew we had a Microsoft store in Austin. I was really considering buying a Surface to really get to know it, and I still am – but with perhaps even greater reservations than I had before spending some time with them. The Surface Pro is just way too much like a laptop or ultrabook for my liking. It really just doesn’t feel much like a tablet at all. 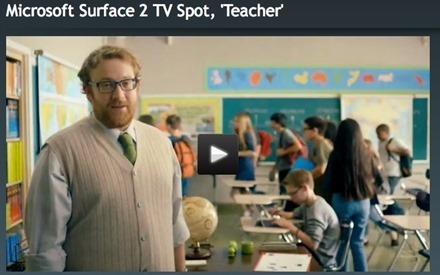 Two of the Microsoft product advisors even agreed with me on that sentiment. So I spent more of my time with the Surface RT. I explored switching between its Desktop and Modern modes quite a bit and had a quick look around its app store. I wasn’t wowed by the Surface RT, but I didn’t hate it either. I might still end up picking one up at some point – or maybe I’ll just wait on their rumored ‘mini’ version.